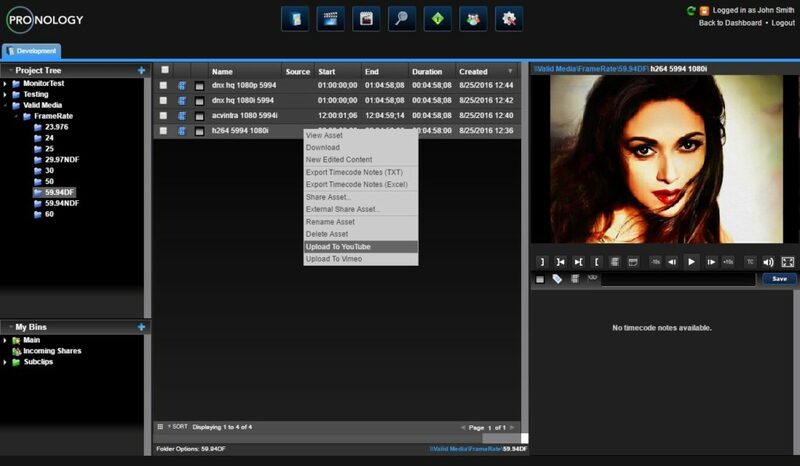 Pronology, a developer of cutting-edge tapeless workflow solutions, will unveil a number of key new updates to its popular and robust CenterPoint™ Media Asset Management (MAM) platform at NAB New York 2016 (Booth 1506) at the Jacob Javits Convention Center on Nov. 9 and 10. CenterPoint, the company’s web- and Windows-based media asset management solution, utilizes a flexible workflow engine that simplifies the daily tasks of end-to-end content creation, management and distribution. The platform now offers significant social media/CMS distribution and the in place management of pre-existing media via a new volume-based indexing update for users in the broadcast, post and production markets. CenterPoint’s social media/CMS distribution capabilities allow users to now publish clips directly from within the MAM system onto various social media platforms with an easy-to-use publish workflow. This new feature works with DropBox, Vimeo, Facebook, YouTube, Wistia and more to help users share content directly without having to first save the clip and then upload it. This publishing feature can be assigned to any user or can be protected by the organization so it may authorize users individually. With the platform’s new storage indexing features, a facility that has existing content (not already in the MAM system) can track and index on any storage platform. This feature can also track assets when they are moved by third party tools, such as NLE’s, within the same storage system so users know where they are. CenterPoint provides users the option of working in the “cloud,” via an internal intranet or a secure Pronology-hosted network. By utilizing a standard web-browser as its primary interface, CenterPoint allows a limitless number of users to simultaneously and remotely perform the following actions: acquire, organize and transcode from ingest; complete real-time logging, sub-clipping and storyboarding; remotely manage approvals efficiently; and archiving. Users are also provided with feature-rich production tools and, as an extension of its approval functionality, CenterPoint offers web video hosting and advanced content delivery services, including multi-platform distribution and VOD delivery for clients looking to monetize their content on the “other” screens.